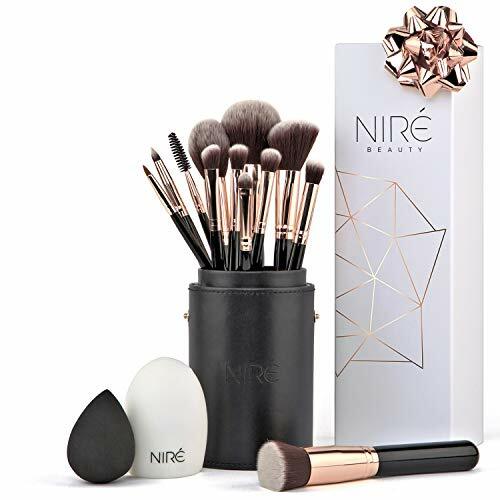 EVERYTHING YOU NEED: 12 full sized professional make-up brushes, a foundation blending sponge, a brush cleaning tool, AND a pro brush holder that opens into two brush cups. Designed by professional makeup artists to help you create ALL those beautiful looks today! STOP WASTING MAKEUP: Exclusive LuxePro Fibers are designed NOT to absorb extra liquids and creams. 100% Vegan Brushes, antibacterial, and hypoallergenic providing better results than animal hair. GLOWING SKIN: The PureForm brush cleaning tool makes washing brushes quick, easy, and effective. Unnecessary break-outs from filthy brushes can now be avoided. Beautiful glowing skin can be yours!GLOWING SKIN: The PureForm brush cleaning tool makes washing brushes quick, easy, and effective. Unnecessary break-outs from filthy brushes can now be avoided. Beautiful glowing skin can be yours! CHOOSE THE PERFECT GIFT: Any makeup lover will be thrilled to receive this set which arrives Gift Boxed and ready to wrap! QUALITY GUARANTEE: Luxe England provides an exclusive 2 YEAR MANUFACTURER'S WARRANTY on all Niré Products. Our brushes are designed to last, 100% satisfaction guaranteed, no-hassle return policy from a British company. Order today with peace the peace of mind!